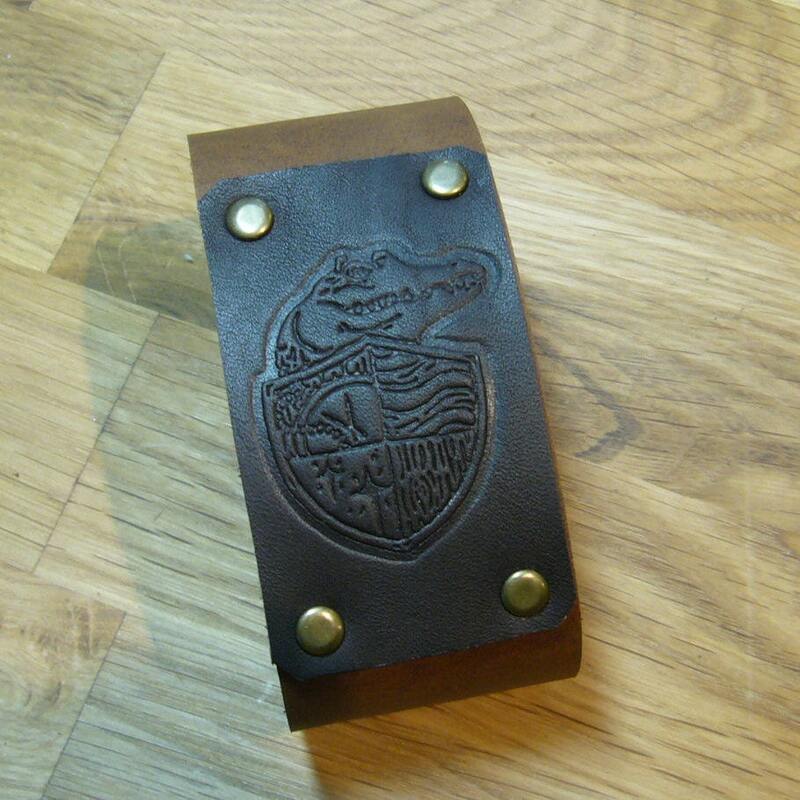 Lost Girls Pirate Academy croc & shield logo is embossed as a "badge" in brown leathers and riveted to a base strap. Aye, matey, be bold and be proud! 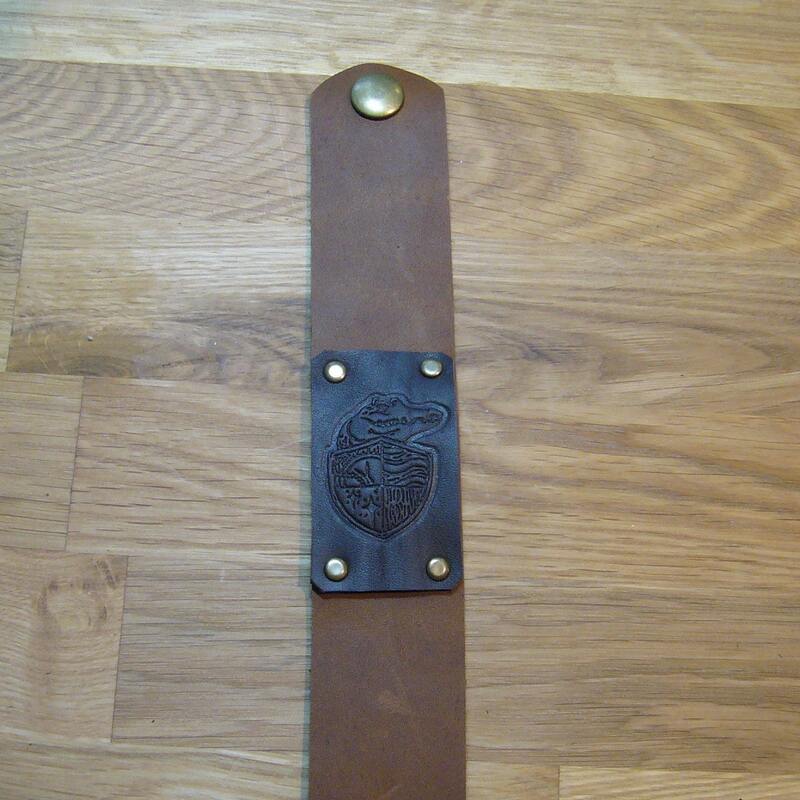 Good for any Pirate of any age or influence, my version of the LGPA logo is embossed onto dark brown cowhide, and accented with antique brass rivets onto saddle brown leather band, which is good for any wrist, especially those of the shipmates of SJ Tucker! The artwork evolved from the guitar strap I made for SJ Tucker and silk screened onto wrist straps, and now an embossed version for "badges" on wrist bands. This image is a "positive" version, and is reverse version of the image on my listing with the black badge on the black & white striped wrist strap. 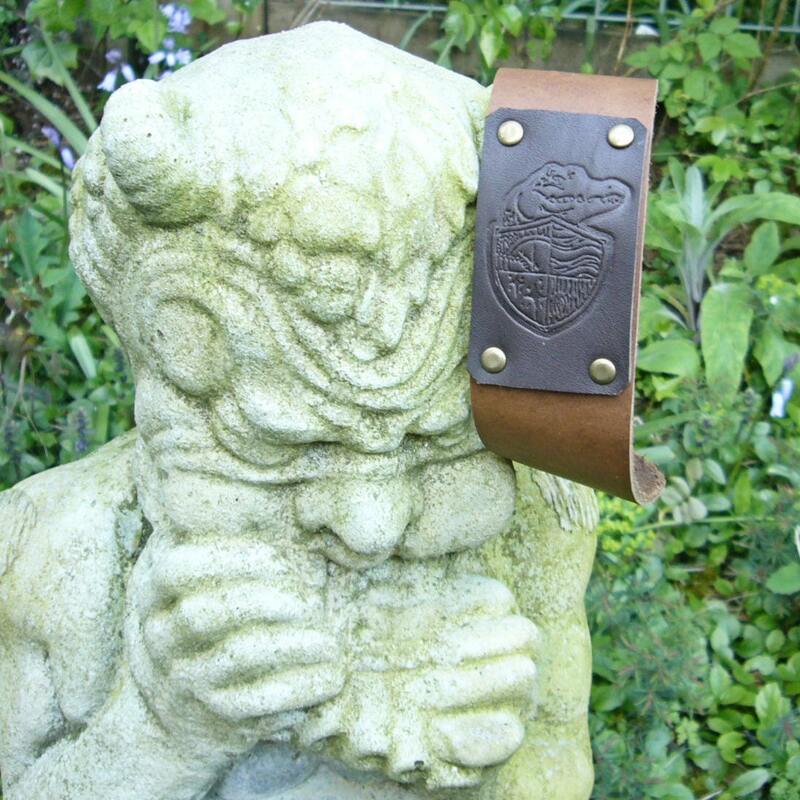 The leathers are very soft on the skin, though it is thick, it is soft & supple to easily conform to the wrist. 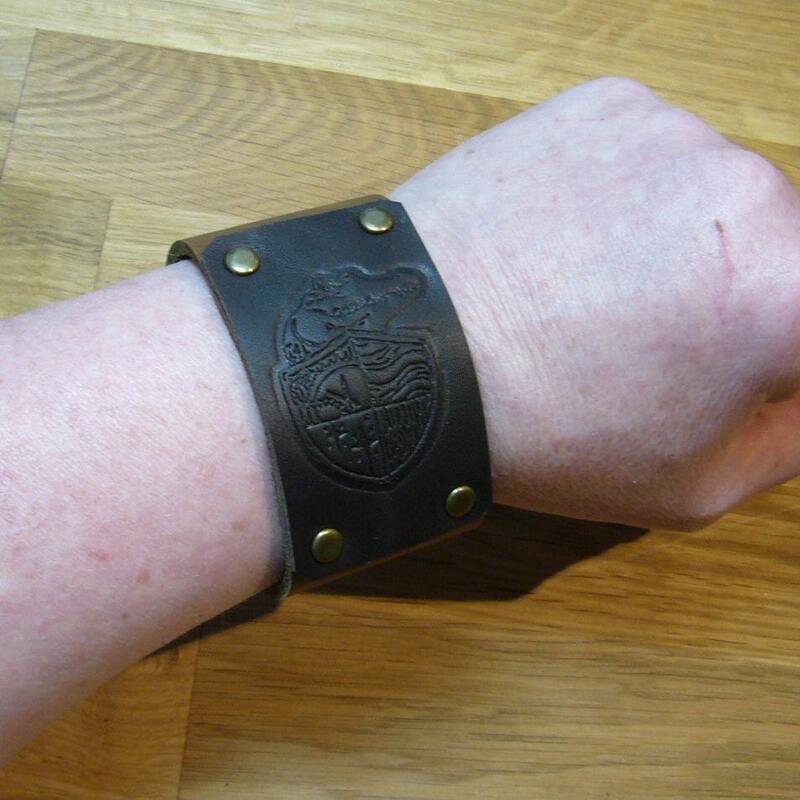 But with with the badge, this is best for a wrist at least 6", but I can start a bit smaller, and make it as long as you desire--as long as I have enough leather!. 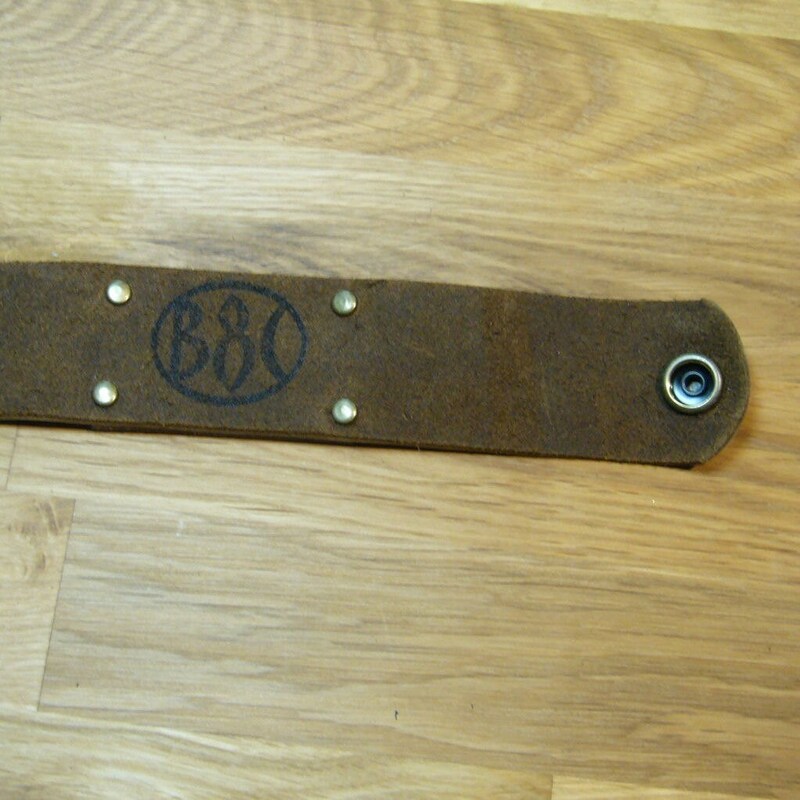 The cowhide embossed with the Toc & shield is trimmed to about 1.5" wide, and is 2.5" long. Four antique brass rivets hold the embossed "badge" to the strap, and an antique brass snap cap with heavy duty snap secures the strap. Please convo me with any questions or color requests. When you order, please indicate your wrist size. I space the snaps to allow about 1/2" extra room for a comfortable fit. If you want a tighter, or looser fit, please let me know. Please see www.bansai8creations.com for more information on the design and guitar straps & Booty Bags.